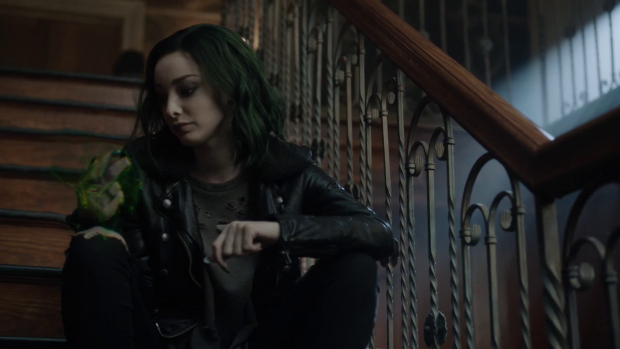 The Gifted returns from Winter Hiatus to deal with the fallout of the previous episode while building towards the finale in different ways. Despite its flaws The Gifted has been consistently character driven since it began. There are exceptions to this but a lot of the plot is informed by the decisions made by the characters and the underlying theme of the show is that the people involved need to work together to survive. The previous episode had losses on both sides with the most prominent death being Sonia so this show has to take the time to deal with that. 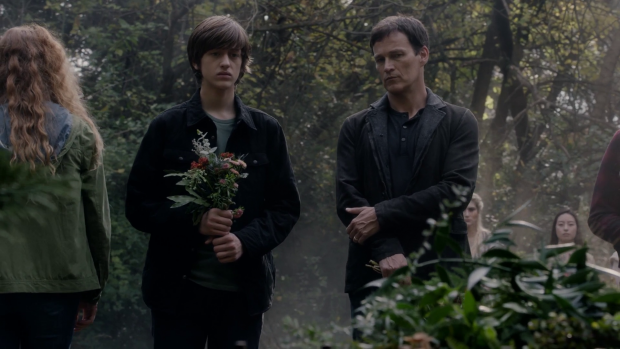 This episode opens with a funeral scene where Lorna and Marcos give impassioned speeches about how much she meant to them as John looks on clearly affected by his grief. Sonia has been a prominent part of the show though wasn’t all that well developed outside of her willingness to make questionable choices in the name of survival and her relationship with John but the loss is felt by the characters because she has been featured pretty much since the beginning and clearly had those pre-existing relationships so dealing with that loss is absolutely worth spending time on. As this is happening Jace is delivering a speech at the funeral for Agent Weeks; a character who has been part of the background for a while but is mostly defined by his work and the fact he was seen with Jace most often. As such it’s a loss that isn’t necessarily felt by the audience but the scene isn’t really about mourning that loss; it’s a way to contextualise Jace’s feelings on Mutants and the current situation. His speech talks about Lucifer being God’s favourite son before betraying him which seems a bit out of left field at first glance though it’s yet another metaphor for Mutants though not a very good one. This story suggests that Jace sees Mutants as being favoured in some way; if not by God then by some other cosmic force and that they are betraying that. All of this sounds really profound and clever but it really isn’t because analysing what he’s saying makes no sense. Jace clearly doesn’t see Mutants as being superior so why would he metaphorically say that they are and what is he trying to achieve by saying this? Is he trying to suggest that Humans represent God so it’s therefore their duty to punish these Mutants for getting ideas above their station? It’s unclear and comes across as pseudo-philosophical nonsense. The loss of Sonia somewhat explains the haphazard approach everyone has to their next move. We basically descend into familiar territory where the same characters have the same arguments that they seem to have every week. 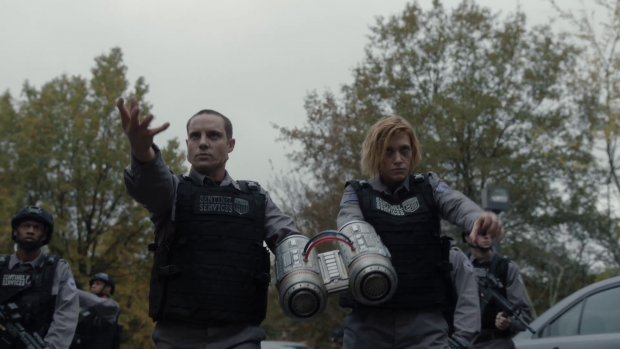 Lorna wants to take revenge by attacking, Marcos argues for taking time to rationally consider their next move and the Strucker parents want to run and hide. It’s all the same stuff and therefore uninteresting no matter how good a job the actors do. Reed and Caitlin’s idea to move on because they don’t feel safe any more feels more plot motivated than character motivated. They have no reason to believe that leaving the Mutant Underground is any safer than staying and they should have learned by now that everyone is stronger as a combined unit. Unfortunately they need to leave so that the plot can move on so it doesn’t matter if it makes sense. This should have provided the opportunity to create a rift between the parents and children who clearly want different things at this point. Reed and Caitlin are terrified so want to leave in an effort to protect their children where Lauren and Andy want to stay because they feel like they are part of a community and feel safer there. Lauren and Andy make no attempt to argue against this decision and simply go along with it without much fuss. Lauren seems upset and has a conversation with Clarice about fear and hatred but the potential for interesting drama goes unfulfilled. It’s a pity this wasn’t explored because the differing viewpoints between the Strucker parents and the Strucker children has been developing for a while so it’s about time it came to a head. What would Reed and Caitlin do if their children didn’t agree with their decions? What could they do about it considering how powerful their children are? Exploring this would give Lauren and Andy an increased sense of agency and would create natural tension that feels like it is motivated by the characters. Reuniting Lauren and Wes was at least reasonably satisfying as something felt unresolved about their connection when they parted ways. This episode doesn’t really do much to capitalise on this though their scenes together are very watchable and it’s good for Lauren to have someone her own age to open up to. It looks like Wes might stick around after this episode so there’s room for this to grow further. The Struckers leaving basically only happens to allow this episode’s action sequence to exist. Sentinel Services/Trask Industries find the safe haven used by the Struckers and attack it with their Mutant Hounds. Dr. Campbell comes up with the idea of combining Mutant abilities to increase the raw power at their disposal. Apparently this was learned from studying Lauren and Andy which seems ludicrous when you think about it as it’s an idea that could easily be hatched independently. If this is all that is to be gained from studying Lauren and Andy then it’s really underwhelming and wastes a reveal that might have been interesting had some thought been put into it. It does tie into the central theme of the show and echoes the binary funeral sequence with both sides of the conflict ultimately thinking along similar lines. Each side realises that combining talents is much more effective than doing things alone even if their approaches are far different. Constantly delivering the message that Mutants and Humans aren’t all that different proves interesting and the fact that the Human characters consistently fail to see that -even the Strucker parents- is darkly funny. Outside of this is Esme’s reunion with her sisters. For the sake of simplicity I’ll simply refer to them as Esme as she has been the focus prior to this episode and said herself that it doesn’t really matter since they are all pieces of a whole. They represent yet another faction in this eternal struggle in the form of the Hellfire Club who are trying to come back from relative obscurity. It feels a little late in the game to be introducing another group with another set of motivations but it’s unclear how they’ll factor into the remaining episodes so I’ll reserve judgement for now. The important thing to consider here is that Esme continues to manipulate people into doing what she wants in order to achieve a goal that is unclear at this point. In this episode she tries to convince Andy to go his own way rather than listen to his parents while putting the idea of doing more in Lorna’s head while pointing out that the pregnancy is changing her in some way. Lorna has a standoffish nature and likes to think that she can’t be manipulated but we see almost immediately that Esme’s words resonated with her. It becomes apparent that her powers are increasing and that the pregnancy is having other untold effects on her. What Esme hopes to achieve by this other than perhaps having a blunt instrument to aim in any direction she -or they- wants is unclear but the way she goes about exploiting insecurities and making people think differently is fascinating to watch. Skyler Samuels’ performance continues to be excellent combined with some really slick production work. The way the triplets work as one being is really unsettling and the audio work on having three of the same voice talk in unison about the same thing is very effective. Samuels approaches her performance in a casually confident way suggesting that the triplets know exactly what they’re doing and are in full control of the situation. Esme and her sisters bring a sense of unease to the show in general as it’s not clear what their motivations are. Dividing the Mutant Underground on whether they should work with them or not is an excuse to have the same debates but it also keeps them on their toes and not sure what to do next. For now they are forced to accept help from the triplets but the true cost of accepting it remains unknown. Hinting at Magneto being a “King” in the Hellfire Club is a nice touch as well though I suspect it won’t have the pay off that viewers expect. I haven’t really mentioned the cold open though these don’t always feel relevant to the episode itself. It is good to see a different side of Clarice as we haven’t seen her in a “normal” setting before now but it doesn’t deliver much in the way of insight about her character other than showing her boyfriend to be someone who would sell her out to protect himself. It’s something of an origin for her untrusting nature though I think the real aim of this scene is to introduce yet another group in the form of the Purifiers who could become prominent if there is to be a second season. Another uneven outing that has some interesting elements but ultimately makes the same mistakes that many episodes have. The binary funeral near the beginning of the episode is great as it ties into the character driven nature of the show by having both sides deal with a loss in a respectful way. Unfortunately this also allows for Jace to deliver a speech about Lucifer that seems profound and clever but isn’t when any analysis is applied to it. 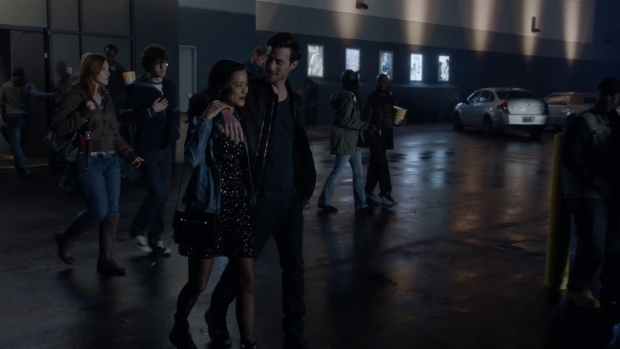 The Struckers leaving the Mutant Underground is more plot driven than character driven though does allow for some strong scenes between Lauren and Wes. Unfortunately nothing else about this works and the potential to create drama from the Strucker parents and children not agreeing on their next move isn’t fulfilled. The episode also goes over the same arguments that we’ve seen in multiple episodes with characters taking the predicted stance on what to do next. Having Esme and her sisters in the mix does make this a little more interesting but overall it feels a bit bland and repetitive. I did like seeing Esme get inside Lorna’s head and help her realise that she’s changing. The endgame here is still unknown but it is interesting nonetheless. I feel that the Hellfire Club might be one faction too many in this struggle and the Sentinel Services/Trask Industries collaboration isn’t living up to any early promise. Loved that they showed John’s grief. We hardly see strong emotions form him because he is the leader and has to be strong.I teared up during his scenes + the one with Clarice telling him she wants to help him.